With a 2 games to none strangle hold looming Ray Allen hit an NBA finals record 8 three pointers to lead the Boston Celtics to a 103-94 victory over the Los Angeles Lakers at the Staples Center. The Celtics were looking for a spark after the heart and soul of the team Kevin Garnett got his second foul early in the second quarter. That’s when Ray Allen began a shooting clinic hitting 7 three pointers in the first half alone. Kobe Bryant never really got into the flow of the game, but he did steal the ball and hit a big three to cut Boston’s lead to only 6 points at the half. Early in the third quarter Boston tried to weather the storm, but could not when the Laker’s Pau Gasol hit a mid range jumper to tie the game up mid-way through the third. Kobe started to heat up and it looked as though Boston was getting ready to let this one slip away, but Celtic’s point guard Rajon Rondo saved the day. Rondo’s 19 points, 12 assists and 10 rebounds was one of the quietest triple-doubles in recent finals history. 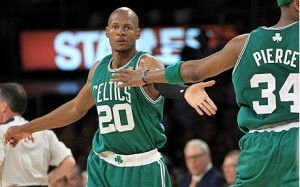 Rondo constantly put pressure on the Laker’s Defense by penetrating and then kicking it out to the deadly Ray Allen. After Allen’s scorching first have, Rondo took advantage of the open lanes after the Lakers started to concentrate on stopping Allen. It was avery exciting game and it now seems as though this NBA finals series will go down to the wire. Game 3 is on Tuesday night @ 8 pm on ABC.